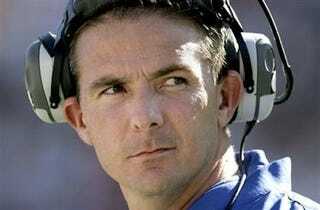 The fuss over Urban Meyer supposedly milking his illness and invoking God to land a prized recruit is exhibit No. one million in the case of why you never believe anything your read on the Internet. Sharrif was really confused and put a call into Coach Meyer. When they spoke Coach Meyer told him that he had a ‘dream' the night before, and that Coach Meyer saw himself on the sideline coaching Sharrif. Told him that is was a "message from God that I should come back and coach, as I guess if it's my time to die, I'd rather die on the sidelines coaching you than anywhere else in the world. At face value, it's pretty disgusting to imagine Meyer using a very serious medical issue as a recruiting tool, to say nothing of playing off the kid's religion. Is it unimaginable? No. But it doesn't quite have the ring of truth to it. The story appeared on a South Carolina blog, and all subsequent mentions credited it. Though Carolina Corner attributes the quotes to "an Ohio State site," there's no link, and Internet searches don't turn up any earlier instances of the quote. I read those comments and when I did I immediately spoke with my head coach Ron Cohen. Coach Cohen told me that it was not true at all and nothing like that was ever said. I immediately called Urban Meyer to let him know what was being said on the internet. I wanted to let everyone know that this is total and false information. I never said that to my coach because it did not happen and my coach never said that to anyone. "I am going to the University of Florida because that is where I want to go. I have a great relationship with Urban Meyer and I am a Gator. A lot of schools tried to hit me with the religion pitch but not Florida, not at all and that's how it is and I am not going to change my mind. I have talked to a bunch of my friends and they think this is something that started on one of the Ohio State boards. People are trying to get back at me for not going to Ohio State and not going to their team but I know what I am and that is a Florida Gator." But here's the thing: Floyd's denial first surfaced on a Gators fans message board, and has yet to be corroborated by any legitimate source. So give it exactly as much weight as you would the initial report. And the Ouroboros is complete.